"The mechanism mediating dried plums radioprotection is uncertain, although there is evidence that specific components including polyphenols, promote osteogenesis and prevent osteoclastogenesis. Purified dried plum polyphenols contains various polyphenols such as gallic acid, caffeoyl-quinic acids, coumaric acid and rutin. These polyphenols are known for their high antioxidant and anti-inflammatory properties." Schreurs A-S et al., 2016. Thus, it is very important to target these cancer stem cells. Importantly, the Moselhy J et al. 2015 study reviewed natural substances that can kill these cancer stem cells. "The cancer stem cell model suggests that tumor initiation is governmed by a small subsey of distinct cells with stem-like character termed cancer stem cells. ... The failure to eradicate cancer stem cells during the course of therapy is postulated to be the driving force for tumor recurrence and metastasis. .... Natural products such as those derived from botanicals and food sources, may modulate vital signaling pathways involved in the maintenance of the cancer stem cell phenotype." ​ Interestingly enough, the researchers commented, "Recent studies evaluating natural products against cancer stem cells support the epidemiological evidence linking plant-based diets with reduced malignancy rates." Moselhy J et al., Natural products that Target Stem Cells, Anticancer Res, 2015. SEE BELOW FOR A LIST OF THESE NATURAL SUBSTANCES. that target cancer stem cells, along with commentary. 25. Withaferin A - Withania Somnife (Ashwaganda)"
FROM A PRESS RELEASE: "Researchers observed that the dried plum powder was the most effective in reducing undesired bone marrow cells’ responses to radiation compared to the other interventions. Additionally, the researchers observed that mice on the dried plum diet did not exhibit decrements (bone volume loss) after exposure to radiation in any of the structural parameters measured. The results of this study suggest that dried plums may serve as an effective intervention for bone loss due to unavoidable exposure to space radiation or radiation.therapy." FROM THE STUDY: "Dried plum was most effective in reducing the expression of genes related to bone resorption (Nfe2l2, Rankl, Mcp1, Opg, TNF-α) and also preventing later cancellous bone decrements caused by irradiation with either photons or heavy ions. Thus, dietary supplementation with dried plums may prevent the skeletal effects of radiation exposures either in space or on Earth." For the Press Release, http://www.californiadriedplums.org/press-room/2016/2/dried-plums-may-help-astronauts-build-better-bones. For the study, Schruers AS et al., Dried Plum Diet Proects from Bone Loss Caused By Ionizing Radiation, Scientific Reports, 2016. HOLY BASIL (TULSI) - CAN THE HERB, HOLY BASIL, HELP PROTECT AGAINST RADIATION DAMAGE? 2016 STUDY. In India, the herb, Holy Basil. is called the Queen of Herbs. In the Baliga MS et al. 2016 study, the researchers stated that, "Holy Basil and its water soluble flavonoids, orientin and vicenin protect experimental animals against radiation-induced sickness and mortality at nontoxic concentrations. Studies with tumor bearing mice have also shown that both Tulsi extract and its flavonoids selectively protect the normal tissues against the tumoricidal effects of radiation. Preclinical studies have also shown that the aqueous extract of the Tulsi leaves; its flavanoids orientin and vicenin, and eugenol, the principal nonpolar constituent present in Tulsi prevent radiation-induced clastogenesis (some mutagenic agent that causes chromosome breaks)." " ... Free radical scavenging, antioxidant, metal chelating and anti-inflammatory effects may contribute toward the observed protection." Patient studies: "In addition, clinical studies with a small number of patients have shown that Tulsi was effective as a radioprotective agent." Conclusion: "Thus, due to its abundance, low cost and safety in consumption, Tulsi has potential of being a nontoxic radioprotective agent and multicentric studies are required." Baliga MS et al., Radioprotective Effects of the Ayurvedic Medicinal Plant Ocimum Sanctum Linn. (Holy Basil): A Memoir. J Can Res Ther, 2016. WHAT ANTIOXIDANT COMPOUNDS IN THE DIET ARE HELPFUL IN REDUCING X-RAY DAMAGE? In the Alcaraz M et al. 2011 study, the researchers studied the protective effects of antioxidants found in the diet against the damage of x-rays. 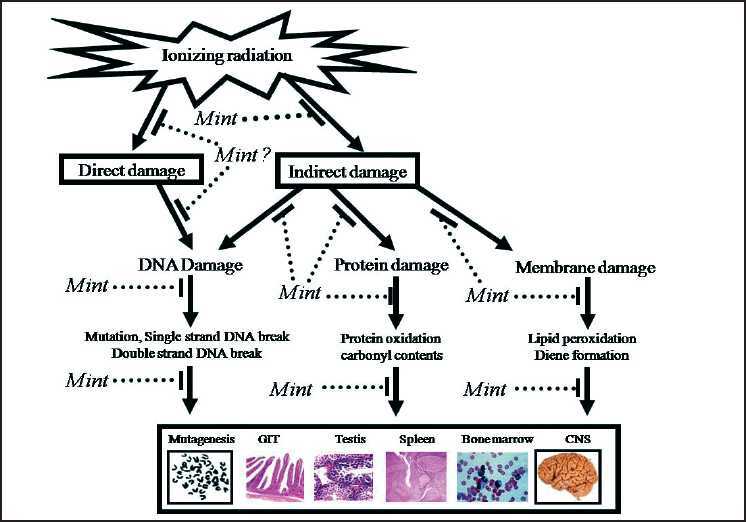 "Ionizing radiation shows a significant genotoxic capacity with the number of micronucleus that show radiation-induced chromosomal damage increasing. We also used the micronucleus test to evaluate the protection capacity of several antioxidant compounds against gamma radiation." ​What are the "radioprotective effects of carnosic acid (CA), carnosol (COL) and rosmarinic acid (RO) against chromosomal damage induced by gamma rays, compared with those of L-ascorbic acid (AA) and the S-containing compound dimethyl sulfoxide (DMSO)?" In the Del Bano MJ et al. 2006, the researchers, via a micronucleus test to evaluate antimutagenic activity, "evaluated the reduction in the frequency of micronuclei in lymphocytes before and after x-rays. Results: "With treatment before gamma-irradiation, the most effective compounds were, in order, CA > RO > or = COL > AA > DMSO." Small Protective Activity: Rosmarinic acid and ascorbic acid (Vitamin C). Lacking Radioprotection: Sulfur-containing compound, DMSO. Conclusion: "Therefore, carnosic acid and carnosol are the only compounds that showed a significant antimutagenic activity both before and after gamma-irradiation treatments." NOW THAT WE KNOW THAT CARNOSIC ACID AND CARNOSOL ARE THE MOST EFFECTIVE ROSEMARY PHENOLS BEFORE AND AFTER X- RAYS, HOW ABOUT AS LIPO-OXIDANTS TO PROTECT CELLS AFTER RADIATION? "It is clear that only the lipo-antioxidants (including rosemary's carnosic acid and carnosol) are effective in protecting human cells against oxidative damage, even when administered after exposure to ionizing radiation." In the Alcaraz M et al. 2009 study, researchers added several compounds, including carnosic acid and carnosol, to human blood before and after x-rays. As we know, x-rays "cause the massive generation of reactive oxygen species and induce cellular DNA damage. And the researchers used a" micronucleus test to evaluate the reduction in the frequency of micronuclei" in lymphocytes. While it did not matter whether the compounds added to the human blood before the x-rays were oil or water soluble, the compounds worked by scavenging free radicals. But it was the adding of the compounds after the x-rays that "the protective effect relies on activity against reactive oxygen species present in cells, i.e. lipoperoxyl radicals, which are mainly responsible for continuous chromosomal oxidative damage." HOW ABOUT ROSMARINIC ACID FROM ROSEMARY FOR SUN (UV) PROTECTION? In the Sanchez-Campillo M et al. 2009 study, the researches explored whether a rosmarinic extract could act as a "photo-protector", as a "free radical scavenger as an inducer of the body's own endogenous defense mechanisms by regulating tyrosinase activity and stimjulating malanin production." Thus, " ...Rosmarinic acid can be proposed as a proper photo-protective agent." ​IS ROSEMARY (ROSEMARY LEAVES EXTRACT) HELPFUL WITH THE BLOOD AFTER RADIATION IN MICE? In the Sancheti G et al. 2007 study, the researchers evaluated the effect of 3 Gy radiation in mice Either the mice were given Rosmarinus officinalis (rosemary) leaves extract ( 1000 mg.kg body weight), or they were given nothing. Blood was collected at days 1, 3, 5, 10, 20, and 30. "A decrease in the number of erythrocyte and leukocyte counts, hemoglobin content, and hematocrit percentage was scored in the control group; whereas a recovery pattern was recorded in experimental animals (treated with rosemary) and a normal value of hematological parameters were regained by day 30 post-treatment." Note that there was a "significant elevation" of estimated glutathione in the rosemary treated mice. There was also a decrease in lipid peroxidation as opposed to the control group. "Inositol hexaphosphate (IP-6) is a polyphosphorylated carbohydrate with potent antioxidant activity to prevent active oxygen species-mediated mutagenesis, cell injury and carcinogenesis. IP-6 also activates DNA repair mechanisms. Sublethal radiation causes DNA damage through the formation of free radicals, reactive oxygen species, and pyrimidine crosslinks leading to cellular proliferation, cell cycle arrest and apoptosis. In the skin it results in the induction of skin cancer, premature skin aging, immuno-suppression, inflammation, and cell death. Likewise sublethal exposure to ionizing radiation as in nuclear blasts (war-time, accidental, terrorist-induced etc), cosmic radiation, etc. also causes the same spectrum of damage to the cells and the organisms with acute symptoms and eventual high risk of many cancers. IP-6 and/or inositol and their pharmaceutically acceptable salts and derivatives, including pyrophosphates and citrate derivatives, significantly counteract the harmful effects of radiation, affecting cell cycle progression in a protective manner (more cells in the protective GI phase) as well as decreasing apoptosis and caspase-3 activation. Various salts of IP-6 are used with comparable efficacy and the combination of IP-6+inositol affords the best protection against radiation-induced cell injury. Thus IP-6 and inositol are effective agents for protection against nuclear, solar and other radiation injuries." Shamsuddin, A et al., 2006. "IP6 is a natural component found in nuts, legumes, most cereal; sesame and corn contain the highest amount - about 5 - 6%; rice bran may contain as high as up to 8.7%." ​ "IP5 and inositol protect human cells against radiation damage in the laboratory (in vitro) in various ways. For example, while irradiation caused incresed cell death (loss of cell attachment, apoptosis and necrosis), IP6 and inositol treatment prevented cell death, in vitro. In vivo (in laboratory mice), IP6 significantly reduces the incidence and multiplicity of UV-induced skin tumors in mice (Kolappaswamy et al. 2009.)" ​In the Williams K et al, 2011 study (which includes Dr. Kolappaswamy), the researchers explored the "protective effects of IP6 against UVB irradiation-induced injury and photocarcinogenesis by using HaCaT cells (human immortalized keratinocytes) and SKH1 hairless mice. We found that IP6 counteracts the harmful effects of UVB irradiation and increases the viability and survival of UVB-exposed cells." In the Mansour SZ et al. 2006 study, researchers evaluated IP6 as "a natural protective agent against gamma-irradiation induced intracellular free radicals, such as superoxide anion and hydroxyl radical,"
The rats were pretreated with IP6, then given a single dose of radiation. In the rats not given IP6? " Radiation exposure showed marked elevation in the lipid peroxide level accompanied by decline in GSH content and in the activity of related antioxidant enzyme." In Cebrian D et al. 's 2007 study, the researchers sought to find a chelating agent for uranium. "... In the case of uranium incorporation, the treatment of choice is so far i.v infusion of a 1.4% sodium bicarbonate solution, but the efficacy has been proved to be not very high. In this study, we examine the efficacy of some substances: bicarbonate, citrate, diethylenetriamine pentaacetic acid (DTPA), ethidronate (EHBP) and inositol hexaphosphate (phytic acid) to chelate uranium." ​In the Hosseinimehr SJ et al. 2006 study, giving intraperitoneal hesperidin at different doses 45 minutes prior to x-rays "reduced the frequencies of micronucleated polychromatic erythrocytes. (Note: This is good, because an increase in the frequency of micronculeated polychromatic erythrocyes indicates damage and fragments.). All five doses of hesperidin significantly reduced the frequencies of these micronucleated erythrocytes (red blood cells.)" More specifically, "The total micronucleated polychromatic erythrocyte values were 2.85 fold less in the 80 mg kg(-1) (maximum hesperidin-dosed) group after being exposed to 2 Gy of gamma-rays than those in the respective irradiated control. Our study demonstrates that hesperidin has powerful protective effects on the radiation-induced DNA damage and on the decline in cell proliferation in mouse bone marrow. "​ Wonderful! ​(See Hosseinmehr SJ et al., Radioprotective Effects of Hesperidin Against Irradiation in Mouse Bone Marrow Cells, Br J Radiol 2006.) ere to edit. In the Pradeep K et al. 2012 study, the citrus flavanoglycone, hesperidin, was evaluated for its protective value after x-rays in the liver, heart and kidneys of rats. Although this chart is not that clear, the dark columns are the irradiated human lymphocytes at baselines, one hour, two hours, then three hours. From the same Hosseinimehr research team that showed that "hesperidin, a flavonoid, has powerful protection effects on DNA damage, reducing the frequency of micronuclei induced by γ-irradiation in mice" (SEE ABOVE), in a 2009 study, the team studied the effects of hesperidin and x-rays on human lymphocytes. In this study, after overnight fasting, volunteers were given 250 mg of hesperidin. Blood was drawn ten minutes before the hesperidin was taken, then afterwards in one, two, and three hour increments. "The lymphocytes in the blood samples collected at 1 h after hesperidin ingestion and exposed in vitro to γ-rays exhibited a significant decrease in the incidence of micronuclei, compared with similarly irradiated lymphocytes from blood samples collected at 0 h. The maximum protection and decrease in frequency of micronuclei (33%) was observed at 1 h after ingestion of hesperidin. These data have important application for the protection of human lymphocytes from the genetic damage and side effects induced by γ-irradiation in patients undergoing radiotherapy." Thus, " These data suggest that hesperidin acts effectively as a free radical scavenger since radioprotection by radical scavenging would be expected to be concentration dependent. There is a maximum leukocyte protection at 1 h after oral administration." ​The 2011 Lee YR et al. study ambitiously sought to discover what effects hesperidin has "on immune reactivity and nutritional status in mice with irradiation-induced inflammation." "Two different concentrations (50 mg/kg and 200 mg/kg of body weight) of hesperidin were orally administered for 6 weeks to mice with or without 15-Gy irradiation treatment starting 2 weeks before irradiation." Results? On day 10 after irradiation, the hesperidin enhanced the splenocyte proliferation. "The percentages of CD4(+) and CD8(+) lymphocytes in the 50 mg/kg of body weight hesperidin group tended to increase compared with the normal group. The concentration of serum cytokines (interleukin-1β, interleukin-6, and tumor necrosis factor-α) decreased in the radiation group treated with hesperidin at 50 and 200 mg/kg of body weight compared with the control group on Day 10 after irradiation. Irradiated mice fed 50 mg/kg of body weight hesperidin had significantly higher levels of total protein and albumin compared with the other groups 30 days after irradiation. In conclusion, this study suggests that hesperidin may enhance immunocompetence, have beneficial effects on nutritional status, and decrease irradiation-induced inflammation in mice." ( See Lee YR et al., Hesperidin Partially Restores Impaired Immune and Nutritional Function in Irradiated Mice, Med Food, 2011.). In the Queiroz de Freitas et al. 2012 study, the researchers " evaluated the protection by selenium (Se) in the bone repair process in ovariectomized rats after irradiation", by placing them in four groups, ovariectomized (Ov), Ov/Se, Ov/irradiated (Irr) and Ov/ Se/Irr. The researchers commented about radiation and bones: "Ionizing radiation is frequently used for the treatment of primary or metastatic bone malignancies. The real mechanism involved in its action on bones is still not fully understood; however, studies have demonstrated that radiation modifies the balance between osteoclastic and osteoblast activity, favoring the destructive process." And, further,"osteoblast proliferation is diminished because there is an attenuated growth rate of irradiated cells and osteoblasts show diminished rates of collagen production. ... Therapeutic doses interfere with bone formation by reducing obsteoblasts, alkali phosphastase activity and collagen production." Emulous of women with osteoporosis who may require diagnostic or therapeutic treatments with x-rays, the researchers chose ovariectomized rats, representing deficient estrogen and increased fragility. A bone defect was created on the tibia of all animals 40 days after ovariectomy. After the rats were ovariectomized, a bone defect was created on their tibias, and two days after surgery, "only the Ov/Se and Ov/Se/Irr rats received 0.8 mg Se/kg. Three days after surgery, only the Ov/Irr and Ov/Se/Irr rats received 10 Gy of x-rays on the lower limb region. The animals were euthanized at 7, 14, 21 and 28 days after surgery to assess the repair process, which was evaluated by analysis of trabecular bone number ...and birefringence analysis ... It was possible to observe a delay in the bone repair process in the ovariectomized/irradiated group and similarity between the ovariectomized, Ov/Se and Ov/Se/Irr groups. In conclusion, sodium selenite exerted a radioprotective effect in the bone repair of tibia of ovariectomized rats without toxicity." In the Jagetia GC et al. 2003 study, the researchers studied the protective effect of a hydroalcoholic extract of ginger in mice against whole-body x-rays. In the 2003 Jagetia GC et al. study, mice were given 10 mg/kg of the ginger extract for five days before being exposed to full body x-rays in amounts ranging from 6-12 Gy of gamma radiation. Subsequently, the mice were monitored for up to 30 days to see if they developed the symptoms of radiation sickness. "Pretreatment of mice with the ginger extract reduced the severity of radiation sickness and the mortality at all doses. The ginger extract treatment protected mice from GI syndrome as well as bone marrow syndrome. ... Irradiation of the animals resulted in a dose-dependent elevation in the lipid peroxidation and depletion of GSH on day 31 postirradiation; both effects were lessened by pretreatment with the ginger extract." In the Samarth RM et al. 2004 study, how effective was peppermint oil against blood alterations after whole body radiation in mice? Mice pretreated orally with peppermint oil for 3 days prior to the radiation "showed protection of the animals in terms of the survival percentage and haematological parameters in mice. Fifty per cent of the animals died within 20 days and 100% mortality was observed up to 30 days post-irradiation in the control irradiated group. Whereas only 17% of the mice died within 30 days in the experimental group (Mentha oil pretreated irradiated)." There was "enhanced survival" in the peppermint oil fed group, suggesting that the peppermint has a "radioprotective role in stimulating/protecting the haematopoietic system", as their blood made "a remarkable recovery, reaching normal at 30 days post-irradiation." In the 2006 Samarth RM et al. study, the researchers explored the efficacy of the leaf of peppermint against gamma radiation, with the results suggesting that "the antioxidant and free radical scavenging activities of the leaf extract of M. piperita are the likely mechanism of radiation protection." The mice were given1 g/kg of peppermint leaf for three days prior to being irradiated. There were "significant increases in the activities of reduced glutathione content, glutathione peroxidase , glutathione reductase , glutathione S-transferase, superoxide dismutase, and catalase.". There was also "strong radical scavenging activity in both the 1, 1 diphenyl-2-picryl hydrazyl radical (DPPH*) and 2, 2 azinobis (3-ethylbenzothiazoline-6-sulfonic acid) radical cation (ABTS*+) assays." Thus, there was an "influence" in both antioxidant and free radical activities. In the 2007 Samarth RM et al. study, the researchers "suggest the protective effects of leaf extract of M.piperita (peppermint) against radiation induced hematopoietic damage in bone marrow may be attributed to the maintenance of EPO (erythropoietin) level in Swiss albino mice." "Erythropoietin (produced in the kidneys and released in response to low levels of oxygen) not only acts on the existing erythropoietin sensitive cells but also on stem cells that enter in the process of differentiation, enabling these cells to proliferate and differentiate into functioning erythrocytes." ..... In the present study, "an increase in pronormoblasts and normoblasts were observed in the leaf extract of M. pipertia pretreated irradiated animals, which shows that leaf extract of M. piperita maintains a high EPO levels, that is responsible for an increase in the number of these cells." Thus, not only were there significant increases in such things as leukoblasts, myelocytes, lymphocytes, and megakaryocytes, plus a decrease in damage and fragments composing micronuclei, but the pretreatment of peppermint leaf prior to the radiation helped maintain the high EPO levels responsible for the functioning of erythrocytes. ​In a 2012 review article, Makhlouf R et al. "investigated the radioprotective effect of Spirulina algae against oxidative stress and tissue injury caused by gamma radiation." In their study, " Rats were irradiated at two doses of 2 and 4Gy from cesium-137 source. Ten days prior to irradiation, animals received Spirulina daily (300mg/kg body weight i.p.).". Results? Spirulina pretreatment in the rats "significantly abolished radiation induced elevation in liver MDA (malondialdehyde - marker of stress) level and significantly maintained hepatic GSH content and CAT activity close to the control values." Also, there was " significantly higher hepatic DNA content". Finally, "It was concluded that administration of Spirulina algae possess a radioprotective capacity against ionizing-radiation induced oxidative stress and organ injury." In the Yogianti F et al. 2014 study, in the long-term exposure of mice to UVB radiation, the "eEpidermal 8-oxoG (lesion) formation was lower" in the spirulina fed mouse group, "clearly indicating that spirulina exerted a suppressive effect on ROS (reactive oxygen species) production caused by UVB radiation in the skin. Indeed, when Spirulina is used as a dietary supplement, it increases the levels of antioxidant enzymes and the basal level of reduced glutathione in the tissues." Summary: Spirulina "inhibited UVB-induced skin tumor development and induction in mouse skin through its anti-inflammatory and antioxidant properties .... It also suppressed the phosphorylation of p38 MAPK, SAPK/JNK, and ERK, indicating that it possesses various effective sites for the inhibition of skin tumor development upon UVB exposure. Spirulina could be safely and effectively used as a daily dietary supplement for protection against UVB-induced skin tumorigenesis...."
L.P. Loseva and I.V. Dardynskaya . Sep 1993. Research Institute of Radiation Medicine, Minsk, Belarus. 6th Int’l Congress of Applied Algology, Czech Republic. Belarus. "Spirulina, a natural food supplement, reduced urine radioactivity levels by 50% in only 20 days. This result was achieved after giving 5 grams a day to children at the Institute of Radiation Medicine in Minsk, Belarus. The Institute has developed a program to treat 100 children every 20 days. This 1993 report confirms 1990-91 research on the beneficial health effects of spirulina on children with radiation sickness. It concludes: 'Use of spirulina decreases radioaction dose load received from food contaminated with radionuclides, Cesium-137 and Strontium-90. Spirulina is favorable for normalizing the adaptative potential of children’s bodies in conditions of long-lived low dose radiation.' "
​ (See http://iimsam.org/en/iimsam-spirulina-resource-centre-3/. 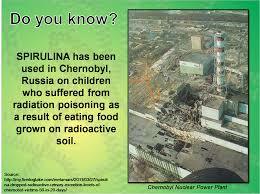 Also, see Dr. Mercola's article on spirulina and Chernobyl radiation damage in children.http://articles.mercola.com/sites/articles/archive/2011/11/09/spirulina-reversed-radiation-damage-in-chernobyl-children-in-just-20-days.aspx." Chlorella is "a fresh water green algae, traditionally used as a nutrition additive, especially as a source of vitamins, specific proteins, and assimilated salts." In the Salma L et al. 1993 study, the researchers investigated the "effects of oral chlorella on frequencies of micronucleated polychromatic erythrocytes in the bone marrow cells of mice subjected to whole body radiation with 1 Gy of gamma radiation." Results? The frequency of micronuclei was reduced 25-40%, so long as the mice were given the chlorella not earlier than one hour before or later than 15 minutes after the irradiation. And the dose of the chlorella could only be at or above 400 mg/kg per body weight. The researchers believed that the composition of the chlorella played a role in its radioprotection. Chlorella contains chlorophyll (27 mg) and beta-carotene (.11 mg) per gram, which could have anti-mutagenic effects. In addition, there is a suggestion of a "chemical repair", since there was radiation protection even when the chlorophyll was given minutes after the x-rays. In the 1995 Singh SP et al. study, the researchers orally administered chlorella to mice either one hour before or immediately after exposure to sublethal doses of x-rays. This oral administration of chlorella "increased the number of endogenous spleen colony forming units." Radiation protection depended upon both the dose of the chlorella and the time at which the chlorella was given. The most spleen colonies were formed when the amount of 500 mg/kg body weight of chlorella was given either one hour before or after the irradiation. Conclusion: "Significant recovery was observed in the number of bone marrow cells and the spleen weight", which is vital as the spleen helps filter the blood and produce white blood cells. In a 2012 case report, Clavo B et al. "described a case of a persistent fistula in a previously irradiated area, which was refractory to treatment but which was successfully treated with local ozone applications." The researchers stated, "Persistent and delayed healing of fistulae and local infection in previously irradiated areas can increase the risk of systemic complications and complicated clinical management. Cancer patients have impaired immune systems secondary to the tumor or oncology treatments; this impairment decreases spontaneous healing." The researchers characterized hyperbaric chambers which have been used" to treat delayed wound healing and several radiation-induced side effects" as "cumbersome with limited accessiblity". And, in addition, "...Treatment and assessment of radiation-induced subcutaneous fibrosis has had limited success." ​Although a nuclear disaster is outside the scope of this THERAPY- RADIATION-MITIGATING DAMAGES' section, there is always the possibility that some one may accidentally receive excess medical radiation. Miso, iodine, IP6 and inositol, spirulina, and chlorella, are a few of the agents that may be helpful in case of some nuclear or medical disaster. But how do these high doses of radiation harm us? In the 2011 Guinan E et al study, the researchers elaborated upon some of the ways that the radiation is harming us, as well as offers two drugs to help ameliorate the damage. Specifically, it is bacteria-derived components that appear to cause the problems following very high doses of radiation. "Bacteria-derived components that engage the innate immune system influence the sequelae of radiation. Endotoxin, found uniquely in the outer leaflet of the outer membrane of Gram-negative bacteria such as the Enterobacteriaceae that colonize the human intestinal tract, translocates into the bloodstream in both bacteria associated and free forms after radiation-induced mucosal injury. Humans are exquisitely sensitive to even picogram amounts of endotoxin, which promotes activation of host defenses in extravascular tissue but produces cardiovascular and pulmonary instability, dysregulated coagulation and systemic inflammation during endotoxemia. Endotoxin sensitivity can be modified by changes in expression of host endotoxin-recognition proteins that promote either endotoxin activity or detoxification and enhanced clearance of endotoxin." Upon discovering that patients receiving hematopoietic stem cell transplantations produce toxicities similar to the high radiation, they discovered that patients after stem cell transplants "developed endotoxemia and reduced bactericidal/permeability-increasing protein (BPI), a potent endotoxin-neutralizing protein, in association with neutropenia." What if this BPI endotoxin-neutralizing protein were replaced? Would this replacement mitigate radiation toxicity? Conducting an experiment with mice, they gave the mice a dose of radiation that would be 95% lethal in 30 days, followed "24 hours later by twice daily subcutaneous injections of the recombinant BPI fragment rBPI" with or without the antibiotic, fluoroquinolone, an umbrella antibiotic that the researchers hoped would be effective against the "endotoxin-bearing Gram-negative bacteria".